We can use rsinaica to find out which city is the most ozone-polluted in all of Mexico. Once we’ve downloaded the data we filter values below .3 ppm since they’re probably calibration errors, and also filter some stations that never report correct ozone values. Given that ozone production depends on chemical reactions between oxides of nitrogen and volatile organic compounds in the presence of sunlight, it’s extremely unlikely to be present in large quantities at night or in the early morning, so we can filter high ozone values during those times. We’ll be taking the average of the maximum daily value among all stations in each network for the entire year of 2017, and only include stations that reported data at least 80% of the days. When plotting the daily maximums we can see that there are still some obvious errors in the data even after removing the stations that always report erroneous data and the extreme ozone values outside peak daylight hours. 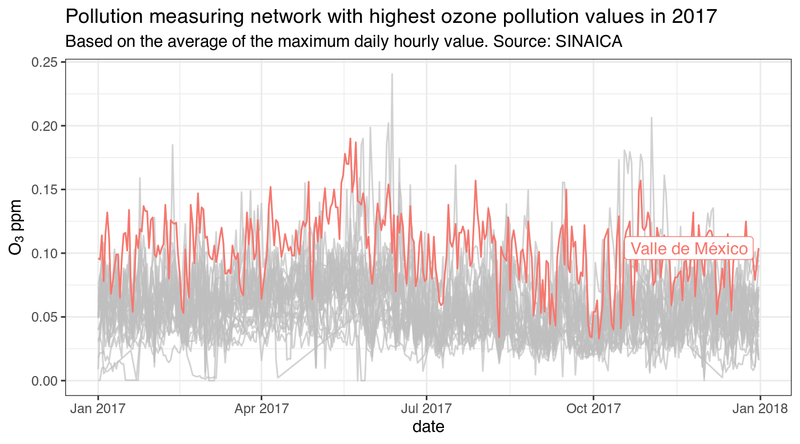 We can use the anomalize package to detect and remove the extreme values, while being careful not to remove the high ozone levels that happen in Mexico City, Guadalajara, and Monterrey. Besides removing the outliers, after looking at the plots it was decided to remove the whole network of Piedras Negras since it only reported ozone concentrations close to zero during the first few months of 2017. Perhaps not surprisingly, the most ozone-polluted cities in Mexico are also the among the most populous. It’s kind of embarrassing that Puebla doesn’t have a working air quality network since it is the fourth biggest metro area by population. title = "daily maximum ozone concentration (ppm)"
Here we see that Guadalajara actually had more very bad days. If this had happened in Mexico City, a phase I smog alert would have been issued and 40% of cars would have been banned from taking to the roads, but Guadalajarans are to smart to implement something like this, since it doesn’t seem to work.